Tom Lubbock writes in his book Great Works: 50 paintings explored about A Study in Clouds by John Constable. He suggests that “If you want to know what negative capability looks like in paint, it looks like this”. He’s suggesting that it all depends whether you are looking for a pattern or not. “Clouds are all sorts. They are a medium of revelation, through which the gods show themselves. They’re a playground for human imagination, where we can see any number of forms and creatures. They are mood music, the emotional backdrop to a scene. They are complex natural phenomena, which challenge our capacity for accurate observation. Artists are free to take clouds and mould them as they will, into celestial signs, or surprising animals, or expressive abstractions. But the discovery in the late eighteenth century that clouds are not an infinitely mutable fluff, that they come in types – cumulus, stratus, cirrus, nimbus – checked that freedom. If clouds are pure formlessness we can do what we like with them. If they have fixed identities they may resist our shaping. 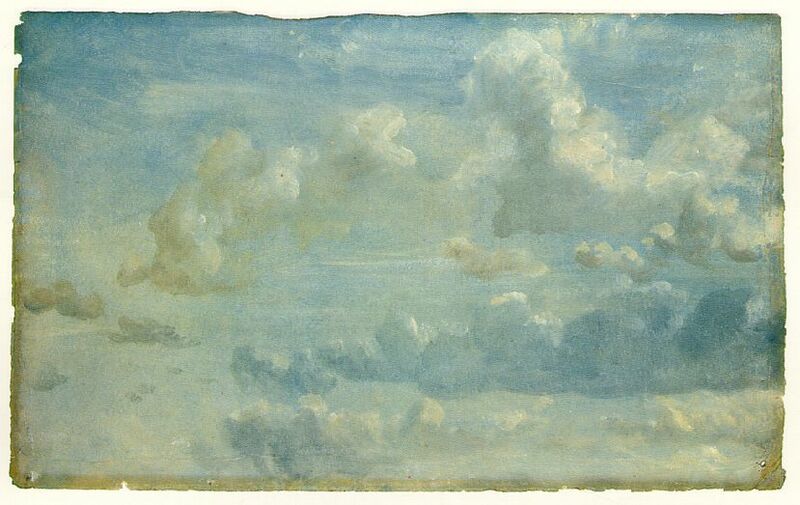 This Study of Clouds by John Constable claims a strictly observational status. His vantage point is Hampstead Heath. The canvas is marked on the back: ’31st Sepr 10-11 o’clock morning looking Eastward a gentle wind to the East.’ Still, the painting itself may leave you wondering what kind of formation you’re looking at. Seen one way, this cloud mass declares a distinct shapeliness. It has a linear structure. Within its dumpiness, you can discern an arrangement of straight lines, diagonals and parallels and intersections and enclosures. It’s formed like a graphic symbol or a Chinese pictogram. It could be drawn out in bold simple marks. It’s a shape that looks like something designed, a kind of skywriting. And given that these are clouds, with their ancient supernatural associations, this pattern may suggest, subliminally, a sign or a message forming in the heavens. Subliminally. But then, the whole effect remains very subliminal. A shape can be detected, yes; but it’s sufficiently diffuse, on the verge of unforming, to keep you in uncertainty about whether it’s really there at all. Dabs of painted cloud build up, but where do they conclusively group? At every point what might be a coordinated design might equally be a loose, unplanned gathering. A deliberate scheme is possible. A pattern is never definite and decided enough to be certain. The structure is so elusive that it might have arrived with no deliberate shaping, through an automatic process. Perhaps it appears in the painting simply because it appeared in the sky. Constable transcribed it with unblinking, unmanipulating accuracy from an actual ambiguous natural cloud formation that looked just like this. Or perhaps his image materialised on the canvas through an act of unconscious, drifting painting, the artist’s brush improvising, somnambulistically, with no comprehensive plan. You can’t be sure the artist was doing any designing. You can’t be sure he was even aware of the quasi-pattern that was emerging through his hand. So Constable’s own painting ends up like nature itself – a phenomenon like a cloud in which you can see shapes, but where no conscious shape-making has taken place. Or if it’s impossible to believe Constable was really unaware of his skywriting, you can see a more complicated kind of intention. He achieved this quasi-shapely cloud mass through a kind of refraining. He managed to paint it as if he wasn’t creating it or noticing it, careful to keep his handiwork always indeterminate and undirected. Five years before Constable made this study, at a house by the edge of Hampstead Heath, the poet John Keats was writing – in praise of a rare creative faculty. He called it, ‘Negative Capability, that is, when man is capable of being in uncertainties, Mysteries, doubts without any irritable reaching after fact & reason.’ It happens when artists know how to stay back, leaving their work open, unsolved, holding unknowns. If you want to know what negative capability looks like in paint, it looks like this.